Putting his pretty plume on proud display, this peacock stands on a high perch so you can take in the full view of his massive tail in all of its iridescent splendor. Peacock's have long fascinated its observers with its ornamental train, and not to mention the lady fowls during mating season. This polyresin peacock statue shows intricate detail to bring out each individual feather and hand painted in shiny shades of blue, green and gold to give it that iridescent look. An eye-catching jewel in the eye of each plume gives it that fancy look peacock's tails are known for. 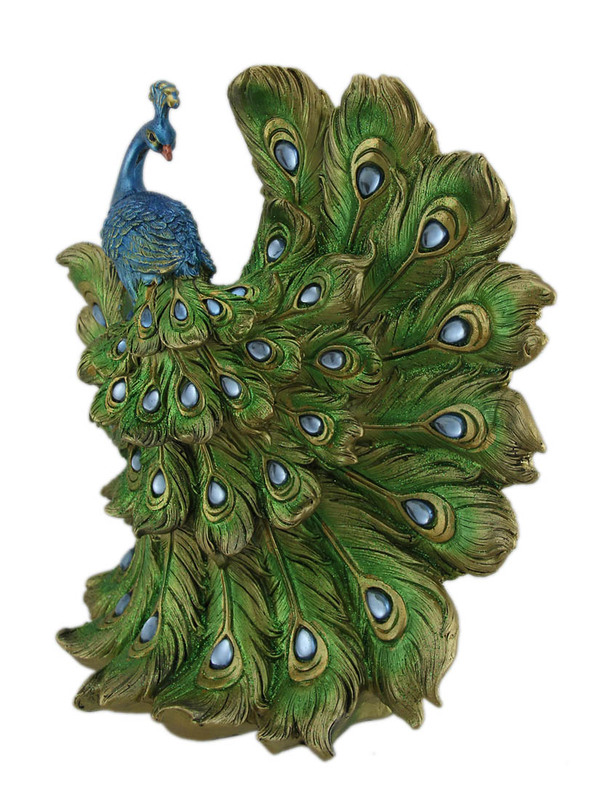 This 13 inch high, 12.5 inch long, 6 inch wide peacock is one piece of decor you'll want on proud display in your home.